In addition to hosting great events throughout the year, both the Ponte Vedra Concert Hall and the Amphitheatre may be rented. The Concert Hall can accommodate up to 450 people and is an ideal setting for weddings, reunions and corporate events. The Amphitheatre's combination of open spaces, stage, and seating, make it a perfect venue for a wide variety of community, corporate, and non-profit events. The Cultural Events Division was created when the County began managing the St. Augustine Amphitheatre following its major renovation in 2007. 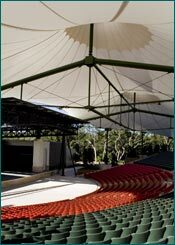 The Amphitheatre is an award-winning, state-of-the-art, outdoor concert venue. The Amphitheatre includes 4,100 guest seats, 4 concession stands, a merchandise area, a large plaza, and an elaborate arboretum of walking trails. A-list acts that have performed at the facility include Aretha Franklin, Alan Jackson, Toby Keith, James Taylor, O.A.R., Lady Antebellum, Alison Krause, ZZ Top, Kid Rock and many more. Visit www.staugamphitheatre.com. The Ponte Vedra Concert Hall was an expansion of the Cultural Events Division in 2011. The smaller performing arts facility is located in the heart of Ponte Vedra Beach. The concert hall features national and international performing artists and an array of activities, concerts and community gatherings. Visit www.pvconcerthall.com.